The greatest science fiction movie never made. I love this documentary! So damn good! Our friends at Collider have debuted a brand new poster for Jodorowsky's Dune, the doc telling the story of Chilean filmmaker Alejandro Jodorowsky's attempt to make an ambitious, awesome Dune movie in the 1970s. It was heralded as one of the best films of Fantastic Fest and also played Cannes, Telluride & Toronto, as it lists directly on the poster, with some quotes from our friends like IONCinema, AICN & Collider. We've seen a number of excellent posters for Jodo's Dune before (see here and here) but this is yet another one for the archives. It's sleek, simple, uses some of my favorite imagery, and says it all right on the poster. See below! In pre-production for over two years, Jodorowsky's Dune adaptation was to star his own 12 year old son alongside Orson Welles, Mick Jagger, David Carradine and even Salvador Dali, set to a musical score by Pink Floyd and art-design by some of the most provocative talents of the era, including H.R. Giger and Jean 'Moebius' Giraud. 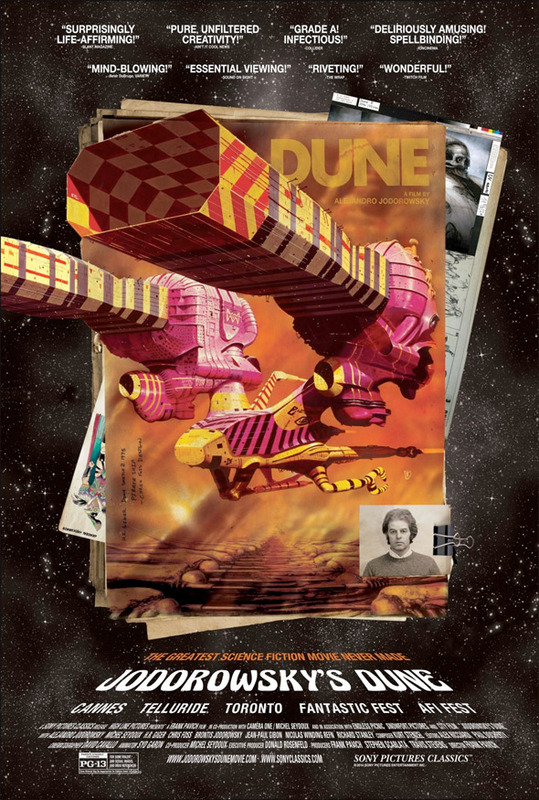 All of this and more is covered in this new documentary Jodorowsky's Dune, directed by Frank Pavich (N.Y.H.C.). The doc first premiered at the Cannes Film Festival and also played the Munich, Telluride & Toronto Film Festivals, plus Fantastic Fest. Jodorowsky's Dune was picked up by Sony Pictures Classics earlier in the summer, and will be released on March 7th this spring. Follow @JodorowskysDune. Love the poster!!! He had the dream team, shame it never happened. Wow. As a sci-fi & Dune fan... must watch.